Should a Coach Take and Share Notes? When working with a client, a coach invariably creates and/or unearths valuable insights, plans of action, and other useful bits which pertain to what that client is ultimately up to and dealing with. A colleague (and CoachAccountable early adopter) recently pointed out that there are many instances of coaches who do not take notes of their sessions, or, if they do, do not share those notes with their clients. I found this to be surprising, and then upon a moment’s reflection not surprising at all. Surprising because for the last several months I’ve been building and evolving a system which prominently features notes as a central facet of the coaching relationship. Then not surprising when I remembered that I myself have done months-long coaching engagements wherein notes were just not part of the mix. On reflection I find the whole thing interesting: while in the thick of coaching, if our call had all the hallmarks of a “good” session (a nice insight or two about wherever they might be stuck, a few new & exciting ideas of things to focus on in the coming week, and hearing my client say “Ooh, good point!” or “Ah, I like that idea!” a few times) I figured I was doing a good job. Especially when they were generally eager for the next time we talked. It never occurred to me that I should go one extra mile and type up the notes from the session. That was their job, right? Of course they would do it for the sake of getting the most of out being coached–if it was their style to do so. This was my thinking. I was in essence confusing the situation for the collegiate model: where students go to class, are motivated to do well, and thus take (and study!) their own notes to cement in the benefit of having attended lecture. But coaching is different, an open ended relationship that usually doesn’t have a tidy ending like the final exam. It’s an oft ongoing process offering no strong cue for note taking (to say nothing of note review). On deeper consideration of the matter I realize several significant wins for note taking and sharing, wins that motivate the practice and guide it. My experience centers around the coach being the one taking the notes, so I’ll treat that here as a foregone conclusion (there may be some great styles of coaching based on the client taking and sharing notes from coaching sessions, but that’s a matter for another essay). Supplementing sessions with note write-ups lets a coach explicitly highlight and reiterate those nuggets that he or she feels are most important, and amounts to the trusted adviser saying to the advisee “Here, I want you to remember and take away this.” In an hour long conversation there are usually all kinds of “aha!” moments and insights. Notes help ensure that a client carries forth more than just a swirl of (easily forgotten) good ideas and a warm fuzzy feeling. They are a sort of director’s cut of the work done together, and tangibly remind readers of the key ideas gained by that work. As a resource that a client can refer to again after one session and before the next, this is a more reliable way to have coaching insights be put into action than to rely on mental recall alone. Shared notes also make solid documentation of the life of a coaching relationship. A review of last session’s notes (by coach or client) quickly orients the conversation for this one. Patterns and reruns are easier to detect by having a progression of notes to review, and so is gradual progress and accomplishment. A few sentences goes a long way. Better yet, the system added those actions without me needing to type them. In total, coaching notes (and the sharing thereof) appear to make a formidable pillar of a coaching strategy: good coaching is made net better when its fruits are efficiently captured for review and reinforcement. They needn’t be a lot of work to create, either. 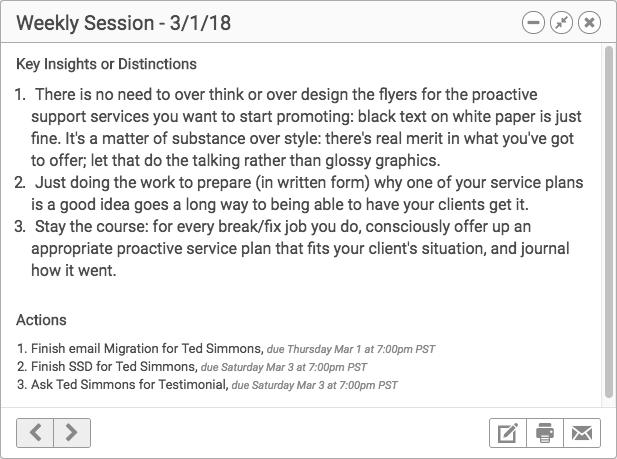 I literally take around 5 minutes to type up my session notes in my standard favorite template: 2 or 3 sentences to recap the current situation going in, and 3 or 4 bullet points of key insights and distinctions are sufficient to distill the real nuggets of an hour long conversation. For me CoachAccountable has made the difference of having notes be a no-brainer part of the process. As my platform for notes, it makes the nuts and bolts of actually capturing, organizing and sharing them dead simple. Compare it to composing notes as emails to clients: in that approach finding any or all past notes requires a search (if I’m lucky) or diligent tagging (or folder organization), and my clients are on their own for similar organization on their end: I can’t provide it for them. In CoachAccountable the system keeps notes all together and easy to access for both me and my clients. The net effect of the system is a powerful nudge towards keeping and sharing notes, by removing some of the barriers of effort and providing a compelling packaging to the value-adding aspect of the coaching experience. Once again after illustrating of my fondness of CoachAccountable as an instrument in my coaching, an invitation to try it seems quite fitting. If you’d like try taking and sharing notes with your clients in CoachAccountable, you can try the software free for thirty days. It’s so much better when the coach takes the notes and the coachee is free to focus on themselves and their thinking rather than trying to make their own notes. A quick summary in the session notes with the actions they have agreed to, and I link to my (livescribe) handwritten and recorded pdf. The session summary is (for me) only the key points and reminders. And getting the coachee to set the actions at the end of the session is a really powerful way to get those locked in. The combination empowers the coachee to make profitable use of their coaching.